Picture a man, young and unrestrained, sprinting across the gridiron of Franklin Field. Now picture the same man running the New York Yankees. Picture a man, tightly wound and armed to the teeth, on the prowl for Nazi soldiers in the forests of occupied France. Picture a man, older and wary, skulking amid the shadowy alleys and questionable loyalties of Cold War Berlin. In each case, the picture is of the same man. His name was Michael Burke, and, as should be plain by now, he was not your typical baseball executive. He stood apart from the blah collection of moneymen known as the “Lords of Baseball,” and not just because of his unusual career, which also included pit stops in the circus, Hollywood, and broadcasting. Burke was stylish, learned, and amiable, but neither his background nor his demeanor helped the Yankees accumulate many victories. His stewardship of the franchise, which lasted from 1966 to 1973, was known to MLB insiders as “The Mike Burke Amateur Hour.” He was at the helm during the time CBS owned the Yankees — the darkest epoch in franchise history, when the team plummeted to the depths of the American League. Regardless of the state of today’s Yankees, what’s certain is that the dudes at the top are far less fascinating than Burke. The Steinbrenners seem largely incompetent and invisible, and their chosen frontman, Randy Levine, is a bland tightwad seemingly hired from New York City’s economic development office merely to help grease the funding of new stadium projects. It’s simple: Levine is a lawyer. Burke was a secret agent. The same might be said for Burke himself. He arrived at Penn as a football recruit — he certainly didn’t have the grades to make it to the Ivy League otherwise. Burke was one of the Quakers’ most exciting players, and he was good enough to earn a shot at pro football. But he walked away after scrimmaging with the Philadelphia Eagles, noticing that the seven-year vet next to him in the huddle “seemed punchy even before the head-banging started.” Burke opted instead for a less-concussive career selling marine insurance on the lower Manhattan dockyards. On December 7, 1941, Burke was walking home from the doctor’s office, where he had just been informed that his wife was pregnant with their first child, when news of Pearl Harbor hit. He enlisted a short time later, fully aware of what that meant for his nascent family. “I was drawn ineluctably to the action of my time,” he wrote. His marriage barely scraped past V-J Day before ending. Burke was in Washington, D.C., when his direction took shape. A chance meeting with a football fan from Philly led to an invitation to a dinner party. Among the guests was William Donovan — known as “Wild Bill” to a nation still in awe of his WWI heroics. Donovan had been tasked by President Franklin Roosevelt with starting an intelligence service. Wild Bill also remembered him from Burke’s days playing for the Quakers. “Why don’t you come and join us?” Donovan asked. Days later, Burke was made a naval officer and began receiving training in the basics of spycraft. He had become, quite by accident, a member of the Office of Strategic Services, forerunner to the CIA. He ran a couple of successful operations in Italy, but Burke’s main contribution to the spy service came after D-Day, when he parachuted deep into the forests of eastern France, well behind Wehrmacht forces, to join a savage guerrilla war alongside French resistance fighters. He was effective enough in combat to win a Silver Star and a Navy Cross. His book isn’t the only account of his OSS days. After the war, Burke enjoyed a brief Hollywood sojourn, serving as the technical consultant to Gary Cooper for the movie Cloak and Dagger. The flick wasn’t much, but during filming Burke met his second wife, a sharp brunette named Timmy. Nonetheless, Burke remained a tried-and-true ladies’ man the rest of his life. Back in New York in 1947-48, he took odd jobs and tried writing poetry. “Rejection slips piled up in earnest,” he remembered, and he took to borrowing money from his father to make rent. As he later admitted, “I had two skills — football and guerrilla warfare.” Pigskin was out, so when the nascent Central Intelligence Agency offered him $15,000 a year to serve during the Cold War, Burke was more than available. One of his early missions was an attempt to mount a resistance to Soviet rule in Albania. Burke zipped off to Germany, where he met with hopeful exiles and potential freedom fighters in a Munich safe house. Burke exuded a veteran’s sangfroid and an American’s swagger — at least in his mind. “I commanded their attention,” he wrote. His audience felt otherwise. “The Americans who prepared us for these missions knew nothing of Albania, the Albanian people, or their mentality,” said a recruiter named Xhamel Laci.1 The operation ended in disaster, with most of the Albanians quickly captured or killed. Next, Burke was sent to Berlin, the major leagues of espionage, where he spent nearly three years tangling with the Soviet spy apparatus. Belatedly, he found himself developing moral qualms about the work he was doing. “We were supporting resistance movements in Poland and Czechoslovakia,” he told the New York Times in 1982. “We were supporting them financially and with arms, but it seemed to me to encourage overt revolt. To encourage uprisings was, I suppose, wrong. Perhaps I can use the word ‘immoral’ because if people in Poland and Czechoslovakia or wherever rose up, what were we going to do about it? Nothing.” Spurred by this reality, Burke soon left the agency. Burke got more than he bargained for. 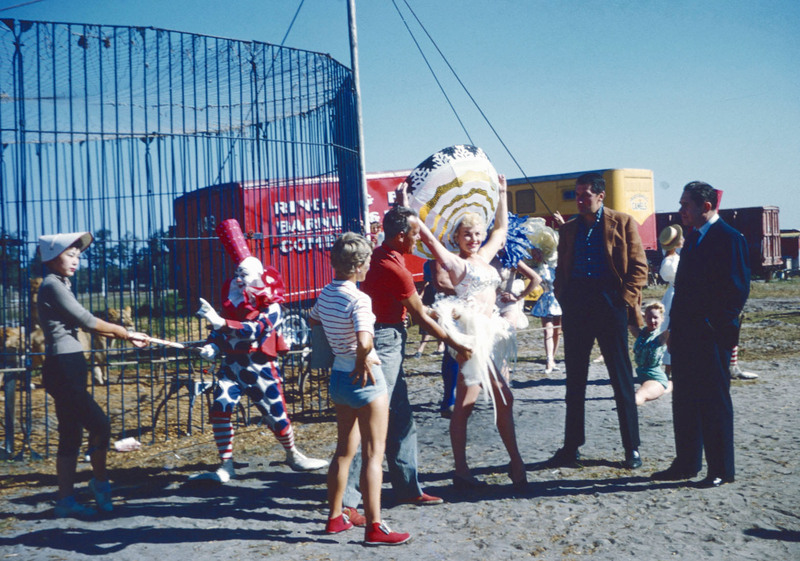 The circus was drowning in debt, and drug and gambling rackets (known to insiders as “The Sneeze Mob”) played as big a role in the business as acrobats and clowns. Burke and his Ivy League sense of fair play ran afoul of Jimmy Hoffa’s Teamsters, who answered Burke’s refusal to play ball by pouring sand in gas tanks, beating up drivers, and stealing loaded trucks to abandon them in distant locales. Frustrated, Burke quit the gig, yet another in a long line of interesting but ultimately disappointing pursuits. Burke’s next job was a plum one — he talked his way into a vice-presidency at CBS, even though all he knew of television was how to turn one on. The company sent him to Europe, where he served as the president of CBS’s Europe branch. Upon returning to the States, he impressed legendary chairman William Paley by recommending and negotiating for the rights to the Broadway production My Fair Lady. CBS pulled in millions from the deal. The lunge for the gig went nowhere, and Burke returned to CBS as director of diversification, his role to look for investment opportunities outside of broadcasting. One such untraditional venture was baseball. In late 1964, shortly after the Yankees prepared to take on the St. Louis Cardinals in the World Series, CBS bought an 80 percent stake in the Bronx Bombers from co-owners Dan Topping and Del Webb for roughly $11.2 million.2 Paley and Burke had visions of entertaining corporate clients and potential advertisers in box seats while watching the surest thing in sports continue its unfettered dominance. Down the line, CBS planned to take over local broadcasts and hype its entertainment offerings to baseball fans. Unfortunately, as Burke put it, “We didn’t go in and feel the goods.” The Yankees no longer possessed an unending assembly line of talent,3 the great stars were aging rapidly, and Yankee Stadium itself was crumbling along with its South Bronx surroundings. The team’s average finish during the CBS/Burke years would be 20.5 games back of first place, unthinkable for the franchise of Ruth and DiMaggio. After appearing in 22 of the previous 29 Fall Classics through 1964, the Yanks disappeared from October for the next dozen seasons. 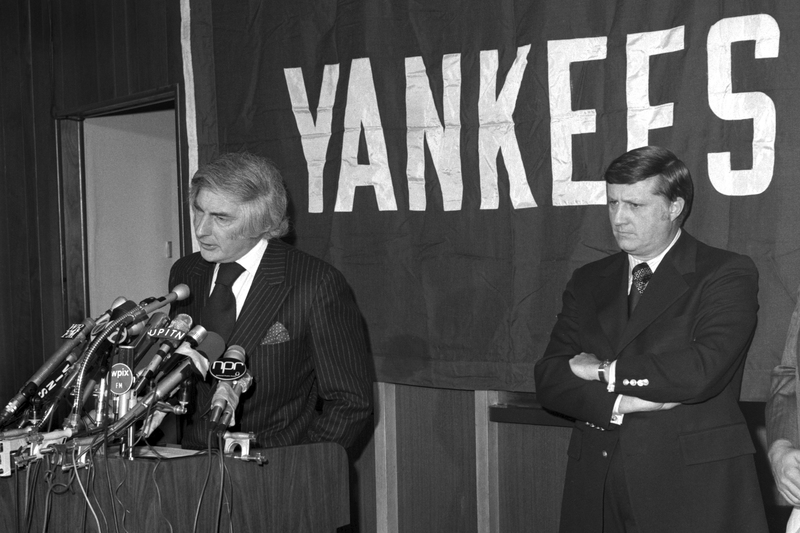 At first, Burke was merely the top CBS liaison to the Yankees, but in 1966, Paley installed him as team chairman and president. Burke swapped a luxurious midtown office, complete with a butler who brought him fresh orange juice and croissants each morning, for the free-falling Bombers. Paley held out one last lifeline. “You don’t have to do this if you don’t want,” he said, but Burke was “happy as a soaring lark” to be a baseball man. “Not in the pejorative sense,” he replied. Two days later, however, the reality of his new job hit home. A mere 413 hardy souls turned out to watch the Yankees, 29 games back in the standings, play the White Sox in a Bronx downpour. Red Barber, the longtime voice of New York baseball, asked the director of the telecast, Jack Murphy, to pan the deserted grandstands, since there was little else to comment on besides the lack of attendance. Murphy refused, and Burke seconded the decision. Shortly afterward, Barber met with Burke to discuss a contract renewal. Instead, Barber was fired. Burke hired Lee MacPhail for the baseball personnel side of the job, though Burke meddled quite a bit when he wasn’t tending to the team’s marketing and business concerns. Critics of the Yankees’ recent surplus of Jeter tributes and Core Four number retirement ceremonies might have been driven mad by Burke’s tenure. He never met a giveaway or tribute he didn’t clasp to his bosom. If Burke were in charge today, A-Rod Syringe Night would probably be on the table. He threw as many love-ins for Mickey Mantle as he could. He brought in Eddie Layton, a contract player for CBS soap operas, to play his organ at the Stadium. He had a pair of Columbia Records songsters pen “Here Come the Yankees,” used to open broadcasts on WPIX for decades. And when Simon & Garfunkel’s “Mrs. Robinson” became a hit song, Burke hung a giant banner asking “Where Have You Gone, Joe DiMaggio?” over the Major Deegan Expressway, an accidental reminder to the poor saps stuck in traffic that the era of Yankees greatness was now purely nostalgia. Burke was certainly hip to the times. He wore his hair long and his sideburns longer, he attended antiwar protests, and, as befit a man who kept a pair of volumes written by Eldridge Cleaver in his office bookcase, he was quite liberal when it came to race relations. After firing Barber, Burke redeemed himself in the eyes of many by finding and hiring Bill White, the first African American to call a game for the Yankees. “We have a stadium not too far from Harlem,” Burke told White. “I want those black kids there knowing that when they grow up they can do what you’re doing.” Burke also pushed the team to diversify its lily-white lineup, but he never managed to find the minority superstar he hoped would someday serve as the progressive face of the Yankees. Despite Burke’s promotional efforts, attendance plummeted with the team’s record. A 1970 article in New York magazine detailed the problem: “He came from the television industry, which supposedly sells a product that is exciting, interesting and entertaining, and in three and a half years he still has a product that is unexciting, uninteresting and unentertaining.” The Mets — the Mets! — had taken over the city.5 In the early 1970s, Burke pushed MacPhail to dump manager Ralph Houk and hire fireball Detroit skipper Billy Martin, but Burke was overruled and Martin wouldn’t begin his managerial career in pinstripes until 1975. Burke credited himself with the moves that helped bulwark the late-’70s teams that restored glory to the Bronx, including the deals for Graig Nettles and Sparky Lyle, but most of the evidence says otherwise. Burke was unquestionably the main driver behind the most critical negotiation of the era — preserving the “New York” in “New York Yankees.” The NFL’s Giants and Jets had abandoned the city for the Meadowlands, and the Yankees were expected to follow.6 The Bronx was in dire need of urban renewal by then. At one point, a new player pulled up to the stadium for a few minutes — long enough for his car to be ransacked and all his gear stolen. Few at the time would have blamed the Yankees for embracing white flight like other franchises across sports, but Burke would have none of it. “You just don’t pick up the team and leave the city because of a few dollar signs,” he said — a sentence that would draw blank stares from modern owners. “What sets a baseball team apart from, say, a dry cleaning business is that … you’re a citizen of the city with civic responsibilities.” Burke turned his considerable charm on Mayor John Lindsay, a fellow patrician type. “That was what Burke was there for,” Pepe says. “He could relate to a guy like Lindsay on a level most guys couldn’t.” In the end, Burke got the city to pony up $24 million7 for a major refurbishment of Yankee Stadium, and the team stayed put in the House That Burke Rebuilt. On the first day of spring training in 1973, the Yankees gathered for their annual team photo. Burke arrived wearing a blue denim shirt, his long mane flowing, gray chest hair open to the breeze. The photographer asked Burke to pose with his new business partner, a 42-year-old, closely cropped, wide-shouldered hoss in a dark suit who seemed to grow angrier with every second the aging hippie shared the frame with him. The photographer later said he could feel tension between the two men through his lens. Big Stein had moseyed into Burke’s Elysian field, and the Yankees weren’t big enough for the both of them. Stung by the endless losing and puny return on its investment, CBS wanted out of the baseball business. Burke saw this as a chance to become one of the franchise’s outright owners. He had breakfast one day with Cleveland GM Gabe Paul, who happened to know of a local shipbuilder’s scion anxious to buy into baseball. 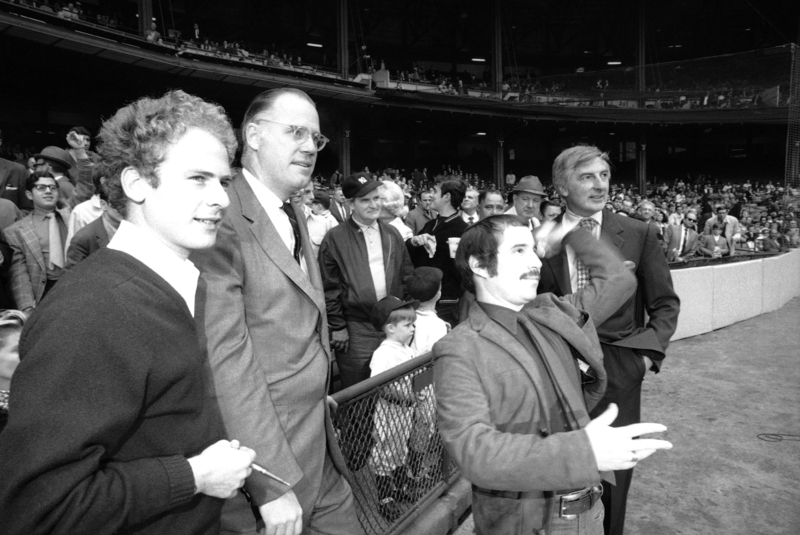 Paul put Burke together with George Steinbrenner, and a partnership was agreed upon. Burke received his percentage of the team for talking Paley into selling to Steinbrenner’s investment group. CBS wound up selling before the 1973 season for a mere $10 million, basically the only time in the long history of sports that a franchise was sold at a loss. That’s right: CBS lost money on the New York Yankees. In that moment, Burke’s relationship with Paley was destroyed. The two never spoke again. A week later, things got worse. At another press conference, Steinbrenner kneecapped Burke by announcing that Paul was leaving Cleveland to become the new team president, even though all had previously agreed that Burke would remain in his post and Paul would receive a token gig for his matchmaking. Steinbrenner preferred a baseball man to the more eclectic Burke. Burke landed on his feet, as usual, moving to midtown to run Madison Square Garden, where he was heckled for being the “guy who ruined the Yankees.” The Rangers and Knicks didn’t fare much better under his watch, but the Ringling Bros. circus was always a big hit when it came to the World’s Most Famous Arena. After eight years, Burke decided to move on again. This most active and peripatetic of careers came to an end not with a heart attack on the avenue but in bucolic western Ireland, where Burke spent the final years of his life on a farm, whipping a DeLorean along the ancient roads of County Galway. “He would be picked apart today — a Twitter scarecrow,” Lipsyte says. Cloak and Dagger wasn’t based on Burke’s wartime action, but he never corrected anyone who said that it was. Yet the bulk of his story checks out. He did win those medals. The Penn football media guide lists him as a letter winner in 1937-38. Enough evidence of his CIA days exists to ensure he did what he said he did with the Agency. Forty-six years later, the Yankees entered this season bloody and bowed. They have defied expectations thus far, but should trouble befall them, alas, no one like Mike Burke is around to render assistance. Robert Weintraub (@robwein) is the author of No Better Friend: One Man, One Dog, and Their Extraordinary Story of Courage and Survival in WWII as well as The Victory Season and The House That Ruth Built. This article originally stated that My Fair Lady opened first in London; it actually opened first on Broadway. We regret the error. According to Tim Weiner’s massive history of CIA fuckups, Legacy of Ashes. Later buyouts brought the total outlay to about $14 million. The architect of the post-war dynasty, general manager George Weiss, had decamped for the upstart Mets. One year after bringing in 80-year-old poet Marianne Moore for the same honor. New Orleans was also a brief possibility, if your brain can handle that concept. Cost overruns raised the final price tag to more than $100 million. Some of this is because the CIA went over Burke’s manuscript with a black marker and redacted anything it deemed embarrassing.